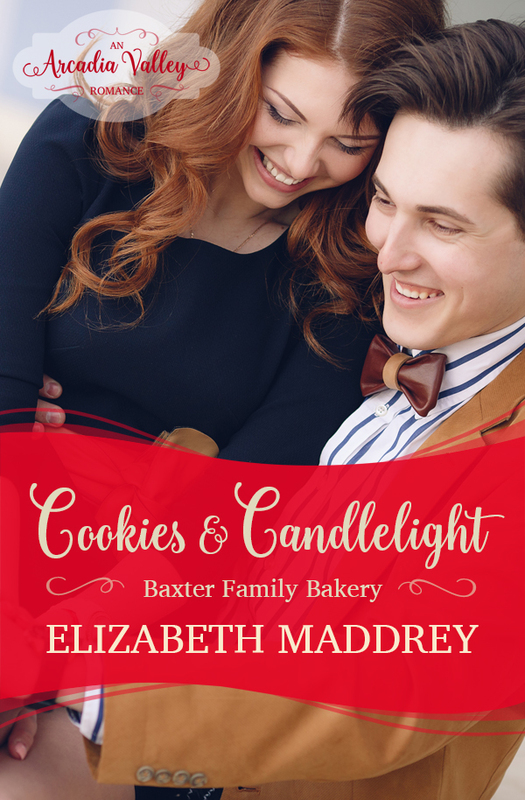 I’m thrilled to introduce you to Cookies & Candlelight, the second full-length romance in Elizabeth Maddrey’s Baxter Family Bakery series, part of Arcadia Valley Romance. I don’t know about you, but I love bread, muffins, and cookies, and Elizabeth Maddrey’s descriptions of these treats as baked by the Baxer siblings does not disappoint. They make me hungry, though! In Loaves & Wishes (part of Romance Grows in Arcadia Valley, the six-novella launch collection), we met big sister Ruth, who inherited a B&B in Arcadia Valley and moved west… and found love. Her younger brothers soon followed her. In Muffins & Moonbeams, we nibbled muffins on the side while enjoying online gamer Malachi fall for Ursula, his online best bud, in real life. Took Ursula a while to clue in, though… Such fun. This time it is Malachi’s twin brother’s turn. Micah delivers a rush order of fancy cookies for a pottery show and gets put to work by the vivacious artist. When he realizes that Serena Johnson was once teen Hollywood star Serena VanderMay — and his own teen crush — he isn’t sure how to handle it. After all, ordinary guys don’t find happiness with someone being chased by the paparazzi! Elizabeth Maddrey is honestly one of my very favorite contemporary romance authors. I’m sure you’ll love Cookies & Candlelight as much as I did. After the accident that killed her husband five years ago, Serena Johnson left Hollywood—and her stage name behind to set up shop as a potter. Her online business keeps her occupied and fulfilled, but she misses having someone special to share her life. Micah stood rooted to the front step as the woman with fiery red hair disappeared into the house. Questions zipped through his mind, but there was no point asking them. She was gone. Hefting the two paper shopping bags full of cookies, muffins, and bread, he tentatively stepped into the foyer and followed down the hall in her wake. That hair. Where did red like that come from? It was like liquid flame spilling down to her shoulders. He gave himself a firm mental shake and stepped into a large, two-story living area. The two outside walls were floor to ceiling windows and sunlight spilled over the space, highlighting the gleaming mission-style furniture and brightly colored ceramic pots scattered around the room. Micah spun. An enormous kitchen sprawled across the back of the room, separated from where he stood by an island with six stools pulled up to the overhang. “We don’t really…” Micah stopped and sighed. She’d disappeared again. Fine. He could throw cookies onto trays. But Malachi was getting a piece of his mind when he got back to the bakery. Not only was her place so far north of town it was practically another country, but he wasn’t a caterer. He lifted the bags to the counter and turned to the sink. He flipped the handle on the faucet and thrust his hands under the water. Soap. Was there…he spotted a ceramic bottle with a pump on the top. Worth a shot. A girly and floral aroma permeated the air as he scrubbed up a thick lather. Micah wrinkled his nose. Hopefully the scent of the cookies would get rid of that. The last thing he needed was to get back to the bakery smelling like a summer meadow. His brothers would never let him hear the end of it. Hands clean, he pulled the boxes of cookies and muffins from the larger bags and started arranging them on the two platters. He made a circle of muffins in the center and surrounded them with cookies. If the woman—Serena—wanted them separated, she should’ve stuck around. Or done it herself. Delivery didn’t mean set up. “Do I look like an eighty year-old British woman?” He heard the testiness in his voice but honestly, he’d fulfilled his duties when he brought her the order. He had work he should be getting back to. And fine, there weren’t many customers on a Saturday, but he’d just started a new space opera on his e-reader. Serena’s grin flashed and her gaze flicked from his head to his toes. Something glinted in her eyes. Appreciation? Couldn’t be. Women didn’t ogle that obviously. Did they? Micah shook his head. He ought to leave. Just walk back out the front door, get in his car, and head back to the book that was waiting for him by the cash register. Except… he could hear Jonah’s chiding voice in his head. A big order like this one—without even a flinch at the extra charge they’d added for last-minute prep and delivery? Serena Johnson was the kind of customer they needed to keep happy so she’d think of them again when she had… whatever kind of party this was. Cookies & Candlelight just released! You can pick it up on Kindle, Kobo, Nook, iBooks, or coming soon in paperback!